Cavan native Jake Doyle-Hayes will spend the rest of the season with Cambridge United. JAKE DOYLE-HAYES HAS gone in search of regular game-time by joining Cambridge United on loan. 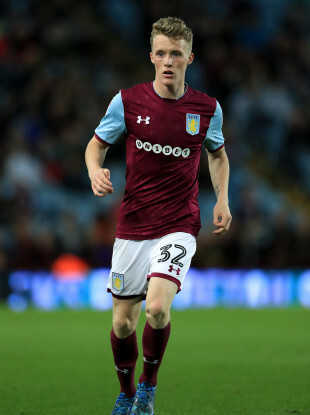 The 20-year-old midfielder, who hails from Cavan, has left Aston Villa on a deal which will last until the end of the season. Doyle-Hayes is contracted to Villa until the summer of 2020 but the Ireland underage international hasn’t yet been able to make a significant mark on the Championship club’s first-team squad. His only appearance so far in this campaign came in a Carabao Cup win over Yeovil Town back in August. He also played twice in the same competition last season. Cambridge United boss Colin Calderwood is already familiar with Doyle-Hayes from his spell as assistant manager at Aston Villa. “He is a young man who I believe will develop into a very good player, and having seen him train before is extremely capable,” Calderwood said today of the Irish youngster. Cambridge United are currently in 20th place in League Two, five points clear of the relegation zone. Irish trio David Forde, Jake Carroll and Gary Deegan are also on the books at the Abbey Stadium. Doyle-Hayes is the second Irish player to make a temporary move away from Aston Villa on deadline day, following on from Scott Hogan’s switch to Sheffield United. Email “Young Irish midfielder leaves Aston Villa for League Two loan switch”. Feedback on “Young Irish midfielder leaves Aston Villa for League Two loan switch”.